Today in Masonic History Edmundo Ros is born in 1910. 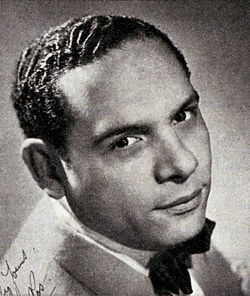 Edmundo Ros was a Trinidadian musician, vocalist, arranger and band leader. Ros was born in Port of Spain, Trinidad on December 7th, 1910. His parents separated shortly after his half brother was born. Ros found himself in trouble quite often and ended up in a military school. There he learned music. He began playing the euphonium and percussion. His mother became involved with a man that he did not like, so Ros left for Caracas, Venezuela and studied at the Academy of Music. Ros continued to play in and around Caracas until his mid to late twenties. He then received a scholarship from the Venezuelan government to attend the Royal Academy of Music in London, England. There he studied, harmony, composition, and orchestration from 1937 until 1942. While studying in London he also worked in various nightclubs including the Embassy Club. He also recorded as a sideman (backup musician) on several Fats Waller tracks in 1938. In 1940, Ros formed his own rumba band called Edmundo Ros and His Rumba Band. The band started at the Coconut Grove club. Before long they were playing all over London, including Bagatelle Restaurant. It was Bagatelle that then Princess Elizabeth and here party came to hear his band. It was at the Bagatelle that future Queen first danced in public. Ros and his band performed often at Buckingham Palace. By 1946, Ros owned a nightclub, a dance school, a record company and an artistes' agency. He grew his band and was recording music with Decca Records. By the time his time with Decca had ended in 1974, Ros had made over 800 recordings. Ros continued to play into the 70's despite the changing musical tastes of the World. In 1975, while touring with his band he discovered that the band was making arrangements with venues behind his back. When they returned to London, Ros arranged a celebratory dinner and announced that he was disbanding the group. He even went as far to destroy all of the arrangement sheets for the band so there was no chance that they could continue on without him. Ros passed away on October 21st, 2011. He was over 101 years old at the time of his passing. Ros was initiated into Chelsea Lodge No. 3098, a lodge exclusively for individuals in the perform arts in London. He later became a founding member of Lodge of Ascension No. 7358, where he was also the Worshipful Master. When Ros retired to Spain he joined Sprig of Acacia Lodge No. 41 in Javea, Spain.